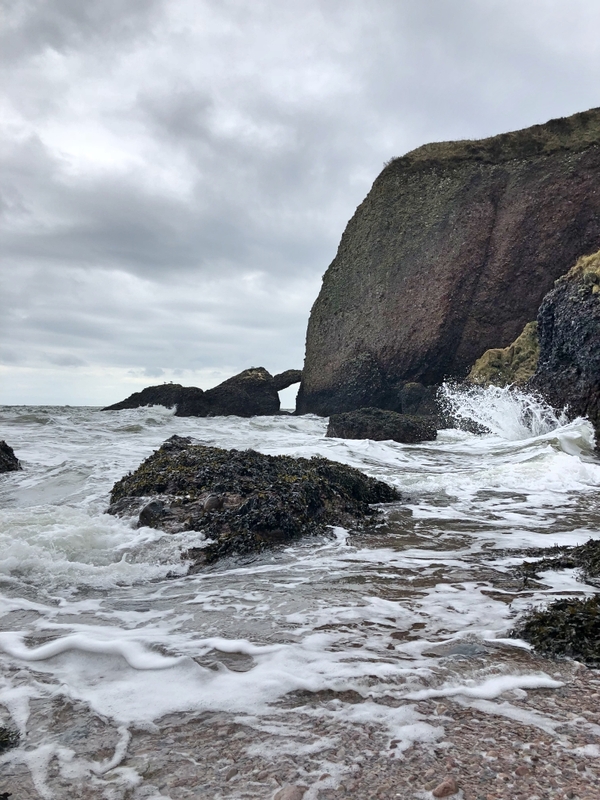 We’ve stopped at Cushendun plenty of times in the past, mostly for food and a short walk around the village’s tranquil little harbour before carrying on up along the Causeway Coastal Route. 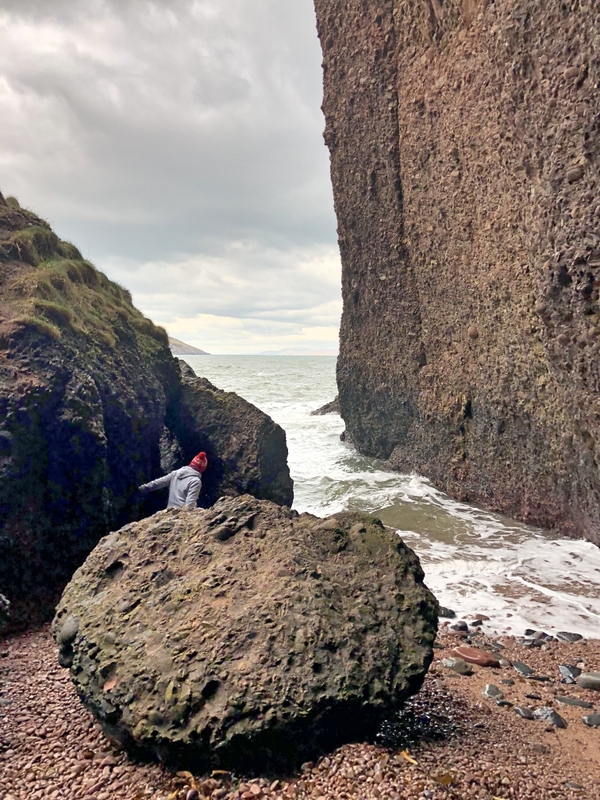 This time - despite the rain, wind and chilly weather - we couldn’t leave before going to find the caves we had somehow managed to miss previously. From Belfast, the quickest way (just over an hour) is to head towards Ballymena and then follow the signs to Cushendall. Cushendun is only another 10 minutes from there. If you’ve a bit more time on your hands, take the coastal route up via Carrickfergus, Larne, Carnlough, etc - which is about 20 minutes longer. From Derry~L’derry, it’s around 1hr 30mins, heading through Coleraine and Ballycastle. But first - while we waited for the rain to ease off - a quick sugar boost from the treats we picked up earlier at Joy’s Artisan Foods (St George’s Market, Belfast). Definitely worth a mention! Even though the caves are not signposted (at the time of writing), they’re very easy to find. 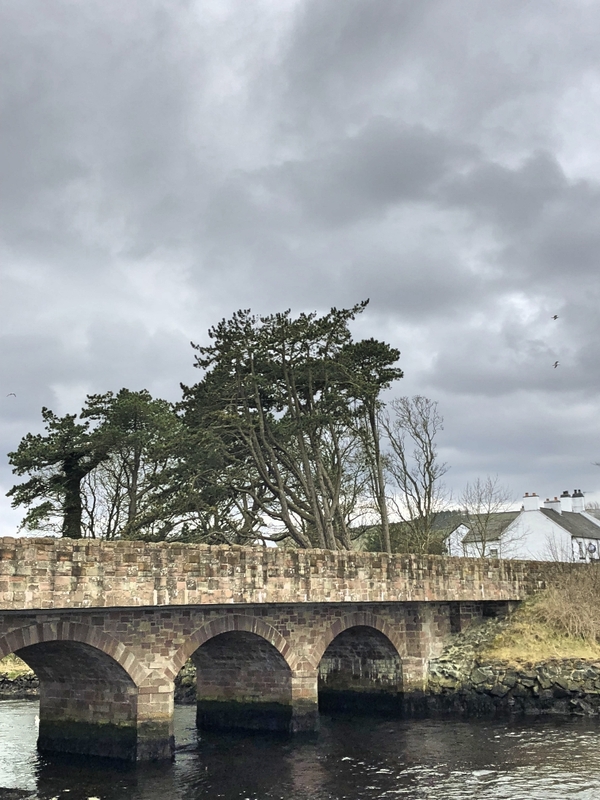 Get yourself to the bridge in the village (pictured above), then head over to the side that the old Cushendun Hotel is on. Walk right on past it and the Glendun Hotel, then on round the corner past the Fisherman’s Cottage. It feels like you’re about to walk into the apartment block’s car park, but the caves are just a further 2 minutes walk past the two grey stone buildings. One of the benefits of a stormy day though - booming waves to heighten the ruggedness (and making the thought of an open fire later even better)! It’s easy to see why this place was chosen as a filming location for Game of Thrones. If you’re a fan, it’s where the Red Priestess Melisandre gave birth to that creepy little creature. Vid further on below. 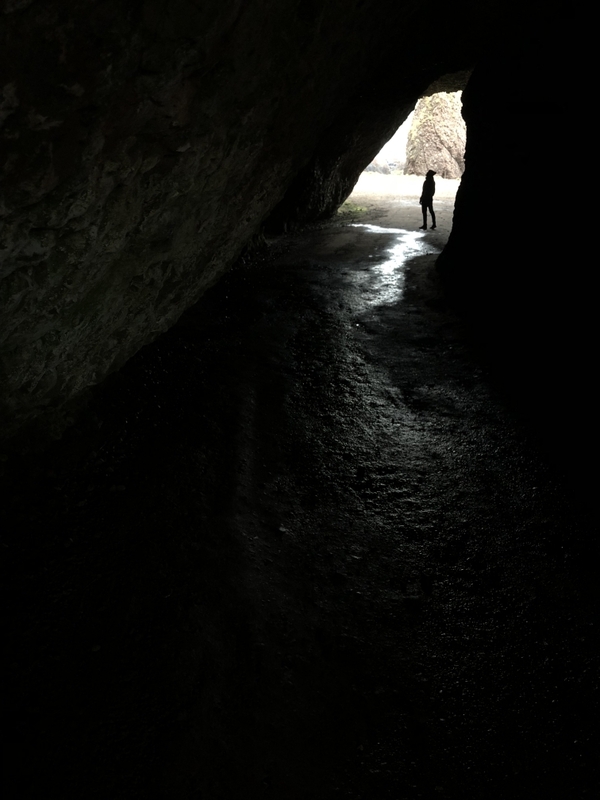 The cave itself is quite short once you’re inside…. …which might help those with a fear of small spaces. Especially with the sound of the waves, wind or rain just outside to make it a little more eerie. Despite their short length, there’s still a lot to intrigue. When you poke your head out at the other side and look up, you realise how much rock is above you. The ‘Game of Thrones filming location’ info point gives you an idea of how they did it. As we made our way back to the village the weather thankfully lifted, giving us a chance to check out more of the harbour area and its residents. 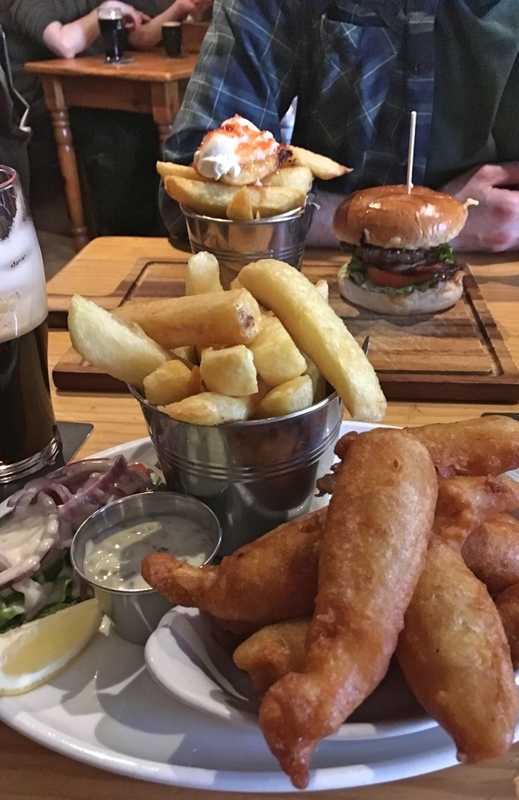 Mary McBride’s in Cushendun not only boasts one of the famous Game of Thrones doors, but also brilliantly hearty food. We always have the intention of trying elsewhere, but gravitate back here each time. Did you spot what was on the left hand side behind the bar? Zoom in. A whiskey and a can of baked beans please, bartender! ^ The Game of Thrones door. You’ll find this inside, at the back of the building. 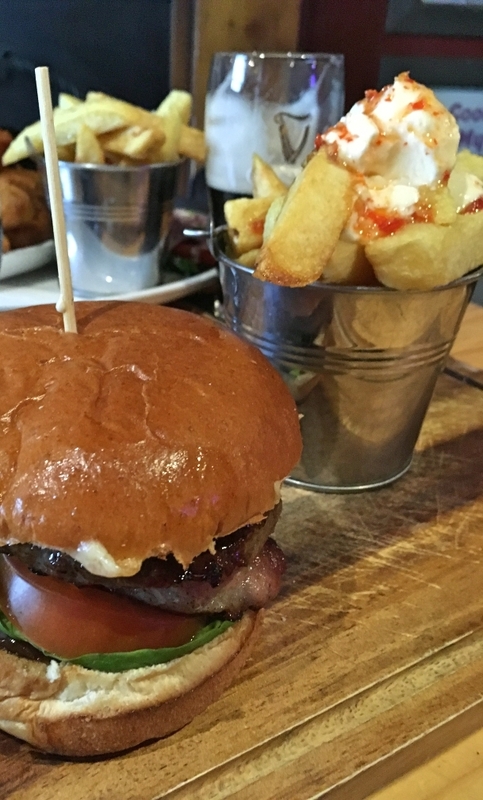 A great gourmet burger, scampi and chips with sour cream & chilli. Epic even on a grey day! We’ll be back soon Cushendun! Want more road trip and adventure inspiration?